Last September, I climbed with a team of scientists and volunteers into the remote high country of Yosemite National Park, onto the ashen hide of the park’s largest ice sheet, the Lyell Glacier. I was there to report but also to assist Greg Stock, Yosemite’s geologist, and Robert Anderson, a glacier researcher from the University of Colorado, in a four-year survey of the Lyell and neighboring Maclure Glacier. The objective was to measure the rate of the Lyell and Maclure’s downhill advance by surveying an array of PVC stakes Stock and his team had driven into the ice over the last few summers. On an earlier trip, in July, we drilled in several new stakes with a six-foot ice auger. Two months of ferocious melting had uprooted many of these. The ones that remained in place were bent like reeds, barely anchored to the ice. The story of disappearing ice is a global narrative. The Lyell and Maclure – like glaciers and ice sheets worldwide – are in rapid state of retreat. 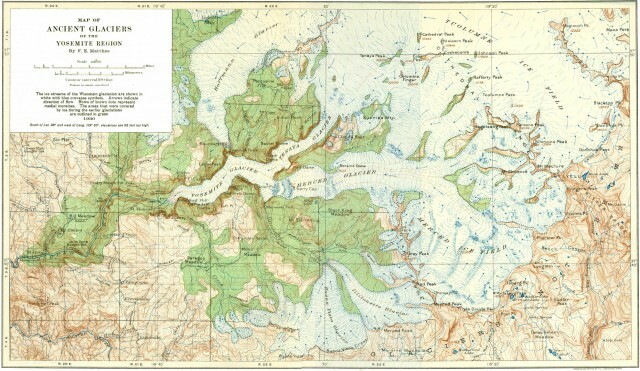 Before the trip, the Lyell and Maclure were presumed to be “true” glaciers – that is, thick slabs of ice dragged downhill under their own weight, scouring the land as they move. But after we came down from the ice, Stock would come to a sober realization. Amid decades of rising average temperatures, the Lyell and Maclure have lost roughly 65 percent of their surface area and an even greater proportion of their volume. 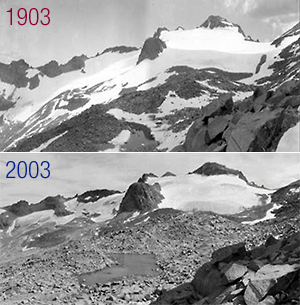 As a result of this mass melting, the Lyell Glacier has stopped moving altogether – transformed from a “living” glacier to a dead patch of ice. Which is to say, the Lyell Glacier is a glacier no more. This is not just a matter of semantics. Meltwater from the Lyell and Maclure feeds the Tuolomne River, the main artery of Hetch Hetchy Reservoir, which supplies water to 2.4 million residents in the Bay Area. Though the total volume of water they contribute to Hetch Hetchy is minimal, the glaciers and permanent snowfields of the Sierra act as important buffers. In late summer, many High Sierra streams go dry. But glacier-fed streams like the Tuolomne supply year-round water to numerous plants, animals – not to mention thirsty hikers. Beyond local effects, glaciers respond to long-term changes in average temperature and precipitation, and serve as powerful barometers of climate change. One or two cold or warm years won’t have much effect. But string a decade or two of warm years together and you will see dramatic reductions in ice cover. This warming trend corresponds to a diminution of the state’s snowpack. As of May 1, the state’s snowpack stood at a meager 17 percent of average. Statewide, snowpack is expected to dwindle by 25 percent by the middle of the century, according to the Department of Water Resources. Beyond their vital ecological roles, these glaciers were also the stage for one of the greatest scientific feuds in California history. When the great wanderer and chronicler of the Sierra, John Muir, traveled to Lyell and Maclure in the 1870s, he was in a heated debate with Josiah Whitney, California’s eminent state geologist, who derided Muir as “a mere sheepherder” for venturing into a field in which he had no formal training. Whitney believed a great earthquake was responsible for the formation of Yosemite Valley. 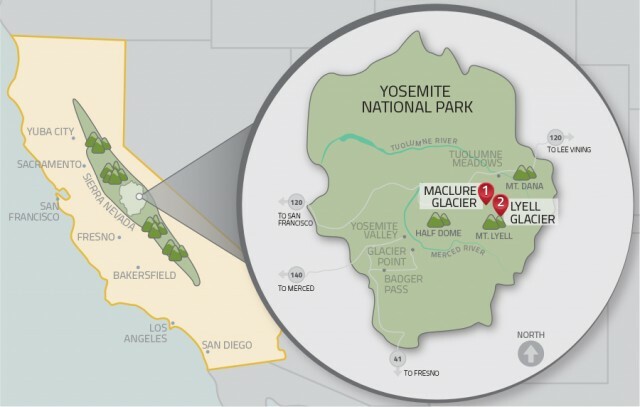 Muir, however, postulated that Ice Age glaciers had sculpted Yosemite’s characteristic cliffs and smooth granite faces. Moreover, he knew small glaciers still existed in high recesses of the Sierra. To prove his point, he set out for Mount Maclure on August 21, 1872. When he arrived, he drove tall stakes of whitebark pine into the ice, surveying them with a makeshift plumb-bob to ensure they’d been set in a straight line. If the stakes had moved when he returned, Muir would have powerful evidence that Maclure’s ice sheet was, in fact, a “living” glacier, moving downhill under its own weight. Though his debate with Whitney would rage long after his discovery, Muir’s ideas today have been mostly vindicated. Around 10 million years ago, the granite of Yosemite Valley was uplifted and simultaneously cut by the Merced River. Then, about 2 or 3 million years ago, during the Ice Age, Earth’s climate cooled rapidly and the glaciers took over – scouring the undulating granite canyons, or “yosemites”– including its most famous, Yosemite Valley. In Muir’s time, the Sierra’s glaciers were near their maximum extent from the so-called Little Ice Age glaciation, a period of cooling and glacial advance that began around 700 years ago. If Stock and Anderson’s estimates hold, these great shapers of the Sierra may be gone within decades. 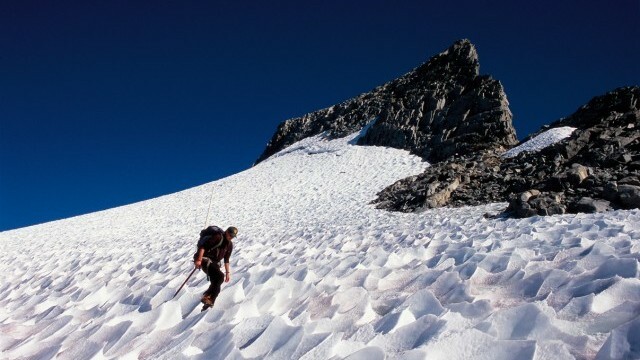 Some of Yosemite’s glaciers have already vanished. In August, I hiked up Illilouette Creek and into the Clark Range, to the site of the Black Mountain Glacier, the first “discovered” by Muir in 1871. He wrote of descending into a deep crevasse known as a bergschrund along the glacier’s uppermost reaches. Its chambered hollows were hung with a multitude of clustered icicles, amidst which thin subdued light pulsed and shimmered with indescribable loveliness. Water dripped and tinkled overhead, and from far below came strange, solemn murmurs from currents feeding their way among veins and fissures on the bottom. Today nothing remains of the Black Mountain Glacier but a few ellipses of snow in a vast basin of gray talus. The day after Stock’s findings on the Lyell, we climbed into the ragged basin of the Maclure Glacier. Unlike the surface of the Lyell, the Maclure bears deep, dark crevasses – signs of a still active glacier. At the Maclure’s edge, dozens of wooden stakes from previous surveys were strewn in the rubble – spat out over the decades from the surging tongue of ice. On the steep slopes of the Maclure, the team set out as they had on the Lyell – scouring the ice for the white PVC stakes and re-surveying them. As afternoon temperatures climbed, runoff from the glacier rose to a dull roar, pouring through vibrant blue fissures into the glacier’s recesses. After the last of the stakes had been surveyed, the team descended. Stock and Anderson pored over the data, performing a few quick calculations. What they found was stunning. The Maclure was not only still moving, it was moving at almost the exact rate Muir calculated back in 1872 – “one inch every twenty four hours.” Somehow, in spite of its loss of ice, the Maclure continues to move at nearly the same velocity that Muir detected. Stock and Anderson may have a solution to the conundrum: The mechanics of the Maclure’s motion may have shifted over a century-and-a-half. Turns out glaciers move by one of two possible mechanisms: deformation and sliding. Deformation is the way the world’s very large glaciers move, with the ice moving in layers or “sheets,” the uppermost sheets moving fastest and farthest. Sliding, on the other hand is not dictated by thickness but the steepness and structure of the rock under the ice as well as the amount of meltwater coating the glacial bed. This meltwater, Stock explains, can come from one of two sources -- melting snow and ice on the surface and "pressure melting" of ice at the bed of the glacier as it is forced around bumps in the bedrock. This water acts as a kind of lubricant, allowing the whole glacier to slide at once. Stock and Anderson suspect that while the extreme loss of ice has caused deformation to cease, sliding continues to move the Maclure at the same rate measured by Muir. But this scenario may not be a sign of the Maclure’s health. “You can move even a thin carapace of ice if you’ve just got a lubricant underneath it,” says Stock, careful to point out that under a critical threshold thickness – one that the Lyell Glacier seems to have crossed and one the Maclure may be fast approaching – movement stops altogether. The best evidence for sliding can be seen from underneath the Maclure. At the glacier’s edge, a lip of ice cantilevers precariously over the talus. Stock, Anderson and the rest of the team quickly duck under, revealing a cave of ice, in most places no more than three feet high and extending perhaps 150 feet beneath the glacier. The cavern was adorned with surreal stalactites and colonnades of contorted ice, some of which probably derived from snow that fell hundreds of years before the first Europeans arrived on the continent. Above our heads, long straight grooves glittered with ice crystals – clear marks of a glacier actively grinding down its rocky bed. Though I knew the Maclure’s footprint was vastly different from when Muir visited 140 years earlier, I couldn’t help but imagine him here, slithering on hands and knees in this magnificent hollow. Our reverie was soon broken. In less than a half-hour, our body heat had discernibly raised the temperature in the cave. Small droplets fell from the low ceiling, making the floor slippery and the tug of gravity more pronounced. It was getting late and we had a long hike back to camp. There was a bright doorway, a glowing oval, where the sun was shining. I snapped a final photograph and slid toward the light. A longer version of this article appears in Earth Island Journal. Our thanks to EIJ for sharing Jeremy Miller's work with us. Photos in the sound modules are by Jonathan Byers and Kirk Keeler. You can see more photos and hear more about the role of glaciers in California's ecosystem in a conversation between KQED Science Editor Craig Miller and Tim Palmer, author of California Glaciers.